I use two faery decks to draw readings. The art of both is drawn by Brian Froud. The Green Man is a deep and potent image of virile, masculine, wildish man, which is fitting for this time of year. He is a complicated, intriguing and unashamedly powerful. The Green Man of faery is the spirit of the forest, the wild wood, the untamed green. The life blood of all living things. The flower that break the concrete. There is a powerful healing force of just being near green, be it garden, park or wilderness. His words are the whisper of leaves, the call of nature. His wisdom speaks of growth, community and connection. Every plant has around it a community reaching for connection. Every tree is a “town” of life, housing many. A forest is a “mega-city” teaming with interconnected life. When faery are too big or too small to comprehend sometimes we recognise them as a feeling. A sense of coloured light. This Guardian marks the place between. Watching, supporting. To me (how you find The Guardian may be entirely different) she has a definite female voice. Sing-song as though there were tiny bells or wind chimes within it. I hear it or become aware of it when a new door opens, or one closes. She is new opportunities, new beginnings. Bright brilliant change, should we accept it. After all she can only hold open the door, it is you whom must walk through it. I see her often in reading shaking her head at those whom never seem to take what is offered. She helps the transition between one state and another. A new job, or title, or way of being. Maiden to mother, mother to crone, crone to light. Watchful as she respectfully ushers you between this and that. She helps give clear beginnings and good endings. Author and shamanic practitioner Barbara Meiklejohn-Free has a variety of hats, including flautist, singer and seer. She was recently in the limelight with her magical partner Flavia Kate Peters, on the TV show Celebrity Haunted Hotel. Barbara took some time out to answer a few questions about her projects past, present and future. Mabh Savage: You describe yourself as a Highland Seer. Can you tell us a bit about what this means? Barbara Meiklejohn-Free: It’s part of a long lineage line, dating back to 15th century, that’s been handed down to me by the previous Highland Seer, Swein Macdonald. He spotted my gifts and abilities and trained me for the age of 12. MS: What inspired the collaborative works, divination of the Ancients and the very recent Witches’ Wisdom Oracle Cards? BMF: We spotted a gap in the market, as well as being inspired by the ancient path of the old ways; that is our mission to re-introduce and re-awaken this way of being, to the modern world. MS: What’s different about working with others on a project like divination of the Ancients to writing a book on your own? Which do you prefer and why? BMF: I love working with Flavia. We both have the same passions for this work. Her channelled writing paints my spirit visions and so we are a winning team who complement each other perfectly. MS: What drew you to working with Flavia Kate Peters? BMF: Spirit brought us together as part of our life purpose. Flavia was already well established in this area when met in Glastonbury 5 years ago, and have had great fun working together as a team ever since. We share the same dreams and goals as well as finishing off each other’s sentences! We both complete each other in the work we came here to do, and we often joke how we are Heaven and Earth – as we cover just about everything together from faeries to angels, to earth based traditions, fire-walking and ancient initiation ceremonies. Not only that, we both sing and perform at events across the world as part of the popular Pagan goddess band ‘Daughters of Gaia’. MS: Your 2013 book, The Shaman Within, has rave reviews and some glowing endorsements from the likes of Dr Jude Currivan and Emma Restall Orr. What moved you to put your own experiences on to paper, to help others find their own shamanic path? BMF: I have gained so much personal experience and felt led to write from the heart in order to help others, through what I had learnt myself. It’s a very down to earth, easy to read book that assists others in walking the shamanic path for themselves. I wanted to take away the seeming complications of shamanism and present it in an easy for all to discover, way. MS: Your previous book was The Heart of All Knowing- Awakening Your Inner Seer. For those not in the know, what’s the difference between a Seer and a Shaman, and how do you employ both skills in your life? BMF: A Seer has the ability to see past, present and future and has natural clairvoyant abilities. A shaman walks an earth based traditional path and draws assistance for healing others, from the spirit world. They have the ability to shapeshift into many diverse roles to help and assist for various modalities such as soul loss, past lives, healing, connecting with the ancestors and the spirit world. It’s natural for me to weave whatever is needed at the time. It’s a knowing. MS: As mentioned earlier, you receive so many fantastic endorsements from people very visible within the Pagan community at large, such as Prof. Ronald Hutton and Anaiya Sophia. Why do you think your work appeals to such a wide range of people, from differing paths? BMF: We cover many different paths, and have personal experience too. Neither of us are ‘book learnt’, we write and teach from first-hand experience. We are both down to earth people who have empathy and understanding for others. We are out there, every weekend meeting and reaching out. So, our reputation goes before us, and with it respect. We both feel so blessed. MS: In The Shaman Within you describe Shamanism as ‘the way of being in harmony with all living things’. Do you think therefore that this book is relevant to anyone, regardless of whether they are on a Shamanic or Pagan path? BMF: Absolutely yes! Both Shamanism and Paganism go hand in hand with regards to following the seasons, the wheel of the year and honouring nature. We are in the middle of writing a book called Shamanic Witchcraft! MS: Do you feel you have achieved this harmony yourself, or is there a way to go on your path? BMF: Yes, definitely living in harmony, which comes with age and wisdom. Anyone who says that they are fully evolved has the furthest to go. There is always something to learn. Everything changes. All we can do is be the best we can be. Do what you will and harm none. MS: You’re often in the public eye; do you ever have negative experiences with the general public either due to ignorance or discrimination? BMF: Because we are very positive and focused in our work and beliefs what we give out is then projected back. What you give out definitely comes back to you, and we are very blessed to be respected and honoured in the work we do. Occasionally we might get some negativity but only from those who are scared of our personal power and have no self-worth or respect for themselves. MS: How was it appearing on Celebrity Haunted Hotel? Did you feel under pressure to portray the image of the witch in a positive light? BMF: There was no pressure to do so, it is just a natural way for us to be. The production team, and presenters, were very respectful as well as fascinated in what we do. They made the decision to ask professional wise women, rather that actors playing at being witches, which came across in an integral and very powerful way. We hoped to inspire others to follow their true path and to show the world that it’s OK to be a witch! MS: Shamanism or shamanic workings seem to be increasing in popularity recently. Do you think this shows the natural urge to regain inner balance or is something else driving this? BMF: The world needs the shamans, witches and wise men and women to bring it back to balance and I feel that many people recognise this now. Not only this, but people aren’t so fearful of standing up for their beliefs and are embracing their inner calling. MS: Tell us a bit about the workshops you run. BMF: My workshops are all based on self-empowerment. My work is to stamp out fear and embrace one’s soul and purpose whether it’s through shamanism, witchcraft, Mediumship, past lives etc. MS: Should we be expecting more books in the near future? BMF: The Shamanic Medicine Oracle Deck and the Faery Godmother Oracle Deck are with the publishers as we speak, and are being launched in 2017. to come, between the two of us, include Walking with the Ancestors, Shamanic Witchcraft, Past Lives, The Dark Goddess and The Hidden Truth. MS: Between your teaching, workshops, writing and other projects, where do you find time for yourself? BMF: There isn’t much time out to be had, but then our work is our passion, our life, so it doesn’t feel too much like work! Taking time out involves going into nature, visiting sacred sites, travelling to distant lands and exploring different cultures. MS: And what’s next on the horizon for you? BMF: We have just started our own publishing house – Solarus Publishing. Although we are very blessed to have contracts with various well known publishers, we do want free licence. So, our publishing house is a rather bespoke one, focusing on truths that some daren’t put into print! For more information on Barbara, visit http://www.barbarameiklejohnfree.com/, and her books and oracle cards are available at Amazon and all other good retailers. Mabh Savage is a Pagan author, journalist and mother of one small boy and two small cats. Find out more at https://soundsoftime.wordpress.com. I love comparing cards! This month we will look at the Major Arcana Strength card and then come to understand it even further by comparing it to The Chariot, the card we examined last month. If you haven’t yet read last month’s column, please do so now. Many Major Arcana cards represent archetypes of people in our lives. The Empress is The Mother, The Emperor is The Father, The Hierophant is The Teacher; we easily understand these archetypes because most of us have them in our lives. Other Tarot Majors represent ideas or feelings or concepts or stories, rather than people. The Strength card is one of these, as Strength is the archetype of goodness and endurance. Like The Chariot of last month, Strength is about courage and self-discipline; however, Strength has an inner focus that allows us to tame and live with our instincts or animal nature. The traditional image associated with Strength is a woman and a lion under a blue or golden sky, with the woman appearing calm, gentle and cultured, gazing peacefully at the lion; not a figure typically associated with the ability to dominate a wild beast. Often the woman is clasping the jaws of the lion or petting or combing his mane; on a few versions she is prying open the lion’s mouth. Some cards show the lion sleeping at the woman’s feet, others show the woman riding the lion. Many Strength cards contain a lemniscate, a geometric shape also found on The Magician. There are often flowers, green grass, and mountains in the distance. The lion is a symbol of our passions and instincts and desires, and it is interesting that while The Chariot offers us the Warrior, Strength presents a woman to tame the lion. Here is the first hint that Strength is not about physical strength at all. The woman tames the lion with gentleness and patience; in many images the woman’s left arm (representing mental effort) is exhibiting effort while her right arm (representing physical effort) is merely resting on the lion. Strength is the number 8 card, which tells us that we have skill to move forward, and the time has come to move, and to follow our instincts. This number represents the concept of a Remedy or a Reaction to the degeneration of the number 7; 8 is the number of building and of destruction that asks us to present a conscious and deliberate response to what has been presented to us to date. In some decks, Strength is switched with Justice and thus is numbered 11. The number 11 reduces to 2, the number of balance, polarity, diplomacy and the energy of “distance between.” This number offers the concept of comparison. Strength corresponds with the element of Fire. Fire corresponds with the Minor Arcana suit of Wands, playing cards suit of Clubs, the cardinal direction of South and the color Red. It represents creativity, ideas, ambition, and growth. This element represents seeds being planted and things being born; Fiery energy encourages us to move forward and to take action based on Divine Will rather than our ego-based Self. In its natural state, the element of Fire is hot and dry. It tends to bring spontaneous change or impulsive, energetic effects. Fire transforms everything in our world. Fire can sanitize or cleanse, and it can destroy everything in its path; Fire can warm us and keep us safe, or it can kill us. Fire is associated with our ability to experience joy and passion (including sexuality), and can represent enthusiasm and a pull towards being physical or artistic; it can also represent recklessness and apathy, a lack of energy and potential health issues. In astrology, Strength corresponds with Leo (“I am,” passionate, dramatic, egotistical). The Sun sign of Leo is connected with the Lion, the king of the jungle, and the Lion plays a huge part in the Strength card. Leo also corresponds with our Sun, the center of our solar system; it is a fixed Fire sign. In Astrology, Fixed Signs are associated with stabilization, determination, depth and persistence. This means that Leos are powerful and willful in all they do, often achieving more than expected. Of course, they can also be inflexible, rigid, stubborn, opinionated and single-minded. Leos are passionate and courageous; they can combine dignity and strength in order to be effective leaders who have a talent for inspiring others to also go above and beyond what is expected. They tend to plunge into a situation without a second glance, but since they thrive on risk and competitive situations, the end result is often good. In the Hebrew alphabet, each letter is connected to the creative forces in the universe, and they express themselves on three levels: one level is archetypical and runs from the first to the ninth letter; the second level is one of manifestation and runs from the tenth to the eighteenth letter, and the third is a cosmic level and runs from the nineteenth to the twenty-second letter. Strength corresponds with the Hebrew letter Teth, the tail or the coiled serpent, the 9th letter in the alphabet which falls into the archetypical level. A coiled serpent has built up its power and is ready to strike; this is seen as a hidden spiritual awareness the release of which creates a reminder of our divine origin. On the Tree of Life, Strength represents Path 19, running between Geburah (the place where forms and structures are challenged or affirmed) and Chesed (the place where forms and structures are stabilized and nurtured), representing Spiritual Intelligence. The 19th Path tells of the balance between strength and severity, and affection and gentleness. It encourages us to endure the tests and challenges that give us the strength and skill to wield Perfect Love and Trust. The 19th Path is one of the Paths that crosses the Tree of Life horizontally, moving in both directions between the sephiroth and spanning the Pillar of Form/Restriction and the Pillar of Force/Expansion. If you remember, The Chariot is a vertical Path, also originating in Geburah, the center of the Pillar of Form/Restriction, but moving upward into Binah and remaining on this Pillar. The Chariot tells of having the control necessary to focus on our goals, and to avoid distractions, and it represents the ability to get to where we need to go, perhaps even the ability to get there quickly, rather than walking. Sometimes The Chariot can represent our mind and intellect and the way our feelings can affect them; both our mind and our feelings need to be controlled with a firm hand. Strength does not tell of physical strength or the use of strong muscles. This is energy without brutality, a feminine strength, irresistible in its gentleness. The Strength card is seen as being connected to The Magician (they both contain that sideways 8, the symbol of eternity), however, The Magician must learn his skills, while the Strength card represents the ideal to be attained and strived for. The lesson The Magician must learn is that gentleness tames violence. Like The Chariot, the Strength card also represents determination focus and power, however there are differences. The Chariot represents the Will, Strength represents Endurance. Two powerful forces, one with an outer manifestation and one with an inner manifestation. Originally, Strength was called Fortitude, one of the cardinal virtues (the other two are Temperance and Justice). Fortitude tells us that we need to moderate our expectations regarding pain and danger, for while we don’t usually want either of them, they can’t be avoided but rather endured. The Chariot has strength and focus, and is able to direct the forces around him in order to arrive at his chosen destination. Strength adds patience and composure to the mix, taming the unpredictable energies so they no longer present obstacles. Strength has a powerful yet subtle message for those who seek to understand the energies of this card: it is not holding on that makes us strong, but it is the act of letting go. A new, tender situation is at hand. It needs to be protected and nourished. The seeds you have planted have begun to sprout. IT is time to tend this new development carefully. Be sure to not let it become crowded out by the weeds and other growths. Tend your new life carefully. Speak over those who would silence you. Listen. Can you hear the frogs croaking in the moonlight? They give their song to all who can hear it. Speak up, speak out, let your message be heard. Speak up for yourself. Raise your voice and drown out those who say that it cannot be done. Speak over those who would silence you. The winds of change are blowing through. Right now you may not be able to see what these changes may be or where they may lead. We are asking that you trust in not knowing. Find peace and calm at the center of change where all is still. In the midst of change, in the midst of growing, this is your reminder of the importance of laugher, of play, of finding joy in life. Take a moment to find the good in life and to focus on the joyful events that are happening around you. Take a moment each day to find 3 things that make you happy, that make you laugh, that bring you joy. Changes are coming. You are being asked to make a willing sacrifice, to give up something of yourself in order to gain much more in return. Hear the calling. Listen to the words. Always you have a choice. Discard the trappings, for they are not you. They are adornments only. Find you underneath the layers. Pull away the weeds that choke the tender sprout, which is you, growing at the centre. Listen to the words you are speaking. Are they the words you want to speak? Does endless chatter choke your words? What truths are you hiding amongst the words you are speaking? Shed those words that hide your truth. Speak the words you are meant to speak. Then you will find peace. You will find the calm in the eye of the storm. Then you will find joy, mirth, and merriment. Then you will find you. 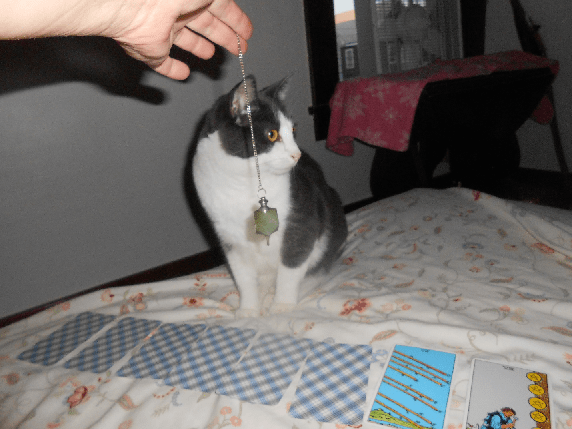 For the past 23 years I have been using amulets for divinatory work and for insight into what is happening in my life. I’ve been doing readings for others for almost as long and can now offer Amulet Readings to anyone around the world. For more information on receiving an Amulet of the Goddess Oracle Reading, contact me through Sacred Visions. This is of course rather confusing but I got out my Rider-Waite deck and after shuffling and cutting them the proper amount of times, I laid out nine cards. I didn’t have a particular question in my mind – I just wanted to see what would happen. The pendulum barely moved or didn’t move at all as I held it over each card. Then – the fifth card – it started moving – very definitely – in an up and down movement. I turned the card over. It was the Queen of Cups, reversed. The pendulum was still until the last card and then it moved in the same definite way. I turned the card over and found The Magician. Given that I have been in my usual summertime depression, I saw the reversed Queen of Cups as my current weepy self and the Magician as the power within me to change my mood for the better. So then I reshuffled the cards and laid out another nine cards. Since time, I asked why I was depressed. As you can see, my cat Radar was helping me! I tried the method other ways. I used three cards, five cards, seven cards. It works best with nine cards. I’m not sure why that is, except that the fewer cards you have laid out, the fewer cards the pendulum picks. With only three cards laid out, it is possible that the pendulum might not pick any one of the three. Honestly, that gave me pause. Maybe the pendulum knows more than I do and it’s just not a good time for a Tarot reading. Another thing I tried was laying out the entire deck, all seventy-two cards. 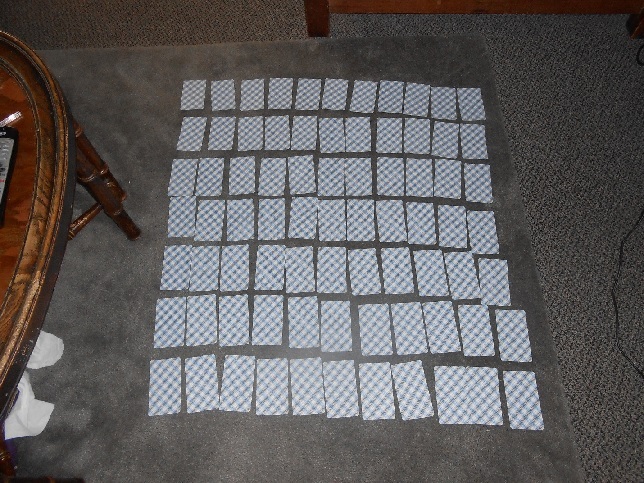 I had to lay them out on my living room floor and it took me quite a while to hold the pendulum over each card as I meditated about my question. I also did a trumps-only spread using the Lovers Tarot and I had a fun time with the Secret Dakini Oracle, and this method works wonderfully with the Motherpeace Tarot too. 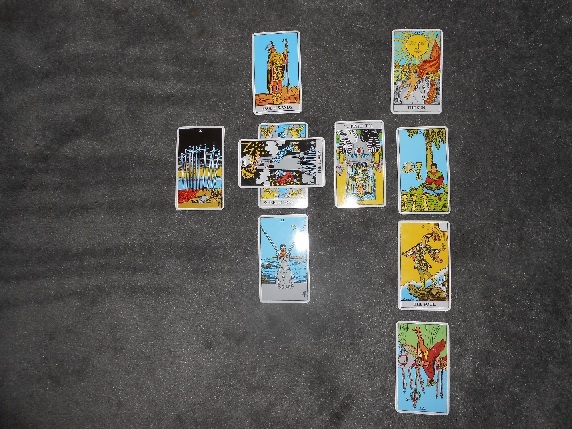 In fact, I am going to try and develop more ways of using the pendulum with Tarot Cards, Oracle Cards, even regular playing cards – I think this is a great way of blending divinatory mediums and I haven’t had this much fun with my cards in years! I know I said this month’s column would be about the runes, but as I began to do my research it seemed as though something just kept getting in my way. I was lying in bed one night trying to figure out why I was having so much trouble putting my words together on this topic when it hit me…BAM….February is the time of one of the oldest and most well known divination rituals that is commonly accepted today. Groundhog Day! I suppose this should have been an easy choice for this month’s topic, the Goddess works in mysterious ways. I actually live about 30 minutes from the quiet little town of Punxsutawney, home of the infamous Gobbler’s Knob and Punxy Phil. I have never been to the actual event, but I’ve heard the tales of horror of bus rides in and out of the town and thousands of onlookers peering at the little rodent awaiting his predictions for the coming season. If Candlemas be fair and bright, Come, winter, have another flight, If Candlemas brings clouds and rain, Go, winter, and come not again. Hence, if the little guy sees his shadow we can expect six more weeks of winter, if not, spring is right around the corner. This is a great example of weather divination, the foretelling of weather conditions by signs, omens or weather patterns. Have you ever stood outside right before a thunder storm and looked up at the rushing clouds hurrying across the sky? What type of feeling does this give you? Do you see it as a message, do you ever think that you were meant to be right where you are at that precise moment to see those exact clouds? Could what you are seeing and feeling be intuition or messages from the higher powers? There is nothing quite as calming as lying down in a grassy patch and looking up at a clear blue sky and using your imagination to look for messages from the heavens. This method of divination dates back to the Druids who not only viewed the clouds as omens from the Gods, but also considered the wind to be the breath of the Divine. What a time that must have been. A time before all mass produced tools were used, when people searching for answers would look to the natural occurences around them. Perhaps that is what we need to come back to, being able to pay attention to what is really happening and letting our intuition guide us by observing what’s around, intuition. The tarot cards don’t literally “speak” to us, they bring messages to our mind that we use our intuition to interpret. So, whether we base our predictions on the thoughts of the old by listening to a rhyme about a shadow bringing the end of winter, or using a new spell board tool we need to remember to listen to that inner voice to fully understand the messages we are being given.